The report presents the results of recent research into the Tappin family, 18th-century clay tobacco pipe makers of Puddle Dock Hill (now St Andrew�s Hill), in the Blackfriars area of London (Figs. 1a & 1b). For many years clay pipe researchers in London have been aware of a distinctive maker's mark that has been found occasionally on archaeological sites and more frequently on the foreshore of the River Thames. The mark was applied as a heel stamp, mostly on pipes dated typologically to the period 1700-1770. It is in relief, and consists of the initials WT separated by a dot, with scrolls above and below, and all within an indented oval frame. What makes this mark unusual is that at the time that it was in use the convention in London was for pipe makers' marks to be moulded on the sides of the heel, rather than stamped on the base. Pipes with this mark have been found in too great a number for them to have been imported (foreign pipes and British regional bowl forms make up a very small percentage of the pipes found in London), so they must have been made locally. Generally it has been assumed that the pipes were made by William Tappin, of Puddle Dock Hill in Blackfriars. However, the attribution of the mark to Tappin was due as much as anything to the fact that he was the only known 18th-century pipe maker in London with the right initials. Prior to this study little was known about William Tappin. His name appeared in Oswald�s list of London pipe makers (Oswald 1975, 147), but the only information available was that he took out a fire insurance policy in 1763. Oswald later published some details of that policy and of another taken out by Tappin�s (presumed) widow Joanna (Oswald 1978, 360). � If the distribution of all known 18th-century pipes marked with the initials WT was plotted, would this show a concentration in the Blackfriars area that would help to confirm their attribution to William Tappin? � Given that the stamped mark appears on pipes that potentially were made much earlier than Tappin's known date of 1763, was the mark used by more than one generation of pipe maker? � Why did the maker(s) using this distinctive and (for London) unusual style of mark? � What can documentary sources reveal about the pipe maker William Tappin, and his family? St Ann Blackfriars was a Thames-side parish lying in the south western part of the City of London, close to St Paul�s Cathedral. It belonged once to the priory of the Dominican order of Black Friars, the land having been granted to them in the year 1275. The friars built a new priory (south of modern Carter Lane and west of Friar Street) and the monastic precinct was enclosed by a western extension of the City wall, which ran up to the banks of the Fleet River (see below). Most of the priory buildings (including the church) were destroyed in 1538, at the time of the Dissolution of the Monasteries. In the 1550s the parishioners were provided with a temporary place of worship (St Ann Blackfriars), but the collapse of its roof in 1597 necessitated the construction of a more substantial church. Within twenty years this proved to be too small for the rapidly increasing population, and in 1617 an enlarged church was constructed with a burial vault beneath. This building was destroyed in the Great Fire of 1666 and was never rebuilt; the parish was united with its neighbour, St Andrew by the Wardrobe, although it retained its own vestry for administrative purposes. The church of St Andrew by the Wardrobe, which was on the east side of Puddle Dock Hill, was rebuilt by Sir Christopher Wren in the period 1685-95. After the Dissolution some of the monastic buildings were adapted to secular use. For example, from 1577 to 1584 the frater or refectory was the site of the first Blackfriars Playhouse. The second theatre to occupy the premises opened for business in 1597 but was eventually closed by the Puritans in 1642, following a long campaign of local opposition. The building was demolished in 1655. Its site is commemorated by the modern street name Playhouse Yard. The parish boundaries were close to those of the former monastic precinct. To the west was the Fleet, a tributary of the River Thames. By the middle of the 17th century the Fleet had become little more than an open sewer. After the Great Fire the lower reaches were enlarged and canalised, in an attempt to improve the condition of the river. At the same time extensive wharves were constructed on either bank. The work was in vain; during the 18th century the river continued to deteriorate, to the extent that it was commonly referred to as the Fleet Ditch. Finally, in 1766 the Fleet was channelled underground to become a sewer beneath New Bridge Street, which formed the approach to Blackfriars Bridge, which was then under construction. To the north the parish extended as far as Shoemaker Row (now Carter Lane) and on the east side the boundary for the most part ran along the west side of Puddle Dock Hill, which was one of the principal north-south streets sloping down towards the Thames. The river formed the southern boundary of the parish. St Ann Blackfriars was engulfed by the Great Fire of 1666, and most of its timber buildings must have been destroyed. In accordance with new legislation passed after the Fire (18-19 Chas II, 8), the houses had to be rebuilt in brick or stone. Roof lines had to be uniform and there were rigidly-enforced rules regarding the heights of buildings. Those on "by-streets or lanes" (which formed most of those in the parish) were to be of two storeys, those on "streets and lanes of note" or overlooking the Thames of three storeys and merchants� mansion houses and those fronting high and principal streets were to be no more than four storeys high. In addition, the Rebuilding Act stated that "no jetties, windows or anything of the like sort shall be made to extend beyond the ancient foundation line of any house". Under the same legislation trades and occupations considered noisome or liable to present a fire hazard were prohibited in the "high and principal streets". Notable buildings in the parish of St Ann Blackfriars were Apothecaries Hall (the home of the City Livery Company) which was rebuilt in 1688, and the King�s Printing House, which had stood in Printing House Lane since the early 17th century and which operated on the same site until 1769. The building subsequently became the first home of the Times newspaper. 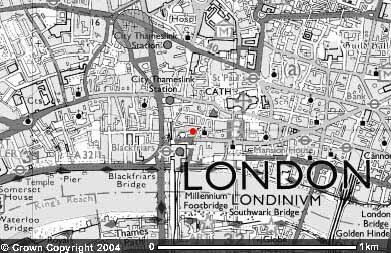 In the aftermath of the Great Fire London�s waterfront was redesigned. The irregular Thames frontage was straightened and extended out into the river, and new wharves were constructed. Puddle Dock (which actually lay just outside the parish boundary) was one of the first landing stages to be open for business (by 1669). There was additional access to the river at Blackfriars Stairs, just to the east of the mouth of the Fleet. Between 1666 and 1704 the parish Vestry Room (sometimes called the Tabernacle) stood in Church Entry, off Carter Lane. It was pulled down to make way for the construction of Joye�s Charity School. Subsequently, vestries and precinct meetings were held in the school house, out of school hours. A new vestry room (still extant) was constructed on the same site in 1890. By the end of the 17th century St Ann Blackfriars was notorious for overcrowding and for an above-average number of divided tenements. Attempts to revive the Fleet had failed, and as a result the parish was also known for its unsanitary and disease-ridden nature. Another reason for the decline of the parish could have been its proximity to the prisons of the Fleet, Ludgate and Newgate, and the House of Correction at Bridewell. As the condition of the Fleet worsened in the first half of the 18th century, so too did that of the adjoining parish. In 1756 one of the reasons for the construction of Blackfriars Bridge (the third bridge to be built over the Thames) was that it would provide an excuse for revitalising the neighbourhood. A contemporary description reveals that this part of the City was filled with "laystalls and bawdy houses, obscure pawnbrokers, gin-shops and alehouses; the haunts of strolling prostitutes, thieves and beggars, who nestling thus in the heart of the City, become a nuisance which it is worth all the money the bridge will cost to remove" (George 1925, 339). The inhabitants of the former precinct of the Blackfriars priory (together with their neighbours on the other side of the Fleet, in the former Whitefriars priory) sought to organise themselves after the Dissolution by petitioning Queen Elizabeth I for certain rights and privileges, or liberties. These are listed below in full (after Burch), because they indicate clearly a strong sense of local community and a feeling among the parishioners that they wanted to run the affairs of the parish without interference from the City authorities. � Freedom from "Watches Wardes Juries of enquires and others to be charged within the cittie"
� Freedom from all "offices, lawes, Statutes, custommes and ordinances of the cittie"
Although the claims of the parishioners were never accepted by the authorities, the liberty of Blackfriars did retain a degree of autonomy in the 17th century. Even if the claim that trades should be allowed to operate there free of the usual restrictions was not based on fact, it is likely that the parish was perceived as something of a haven for immigrants and itinerant craftsmen. This might explain why, by the end of the 17th century, the parish was so overcrowded. It might also go some way to explaining why, during the course of the 17th century, there was a gradual decline in the status of the inhabitants of the parish. During the reign of Elizabeth I, St Ann Blackfriars had its fair share of prominent residents. According to Burch the parish registers show a decreasing number of "gentry and titled persons" throughout the 17th century. Apart from its status as one of the liberties of London, a key factor in defining the character of St Ann Blackfriars in the 17th century was its place as a centre for religious non-conformity. Even before the Civil War the parish was known for its Puritanism, as witnessed by the strong local opposition to the opening of the second Blackfriars Playhouse. At the beginning of the century the minister, Stephen Egerton, was a prominent Presbyterian who was often in trouble with the ecclesiastical authorities. He was succeeded by William Gouge, a leading Puritan who also came into conflict with his superiors for his outspoken views. The rise of Puritanism and radicalism in the parish was presumably linked to the declining status of its inhabitants and to the increasing numbers of craftsmen who were attracted there. Even after the Restoration, there is evidence that religious non-conformity resulted in local in-fighting for control of the parish. In 1662 Richard Denby, who had been clerk of the parish during the Commonwealth, was suspended for non-conformity despite having been granted a licence by the Bishop of London. After a lengthy court case he was re-instated in 1666. Also in 1662 there was a disputed election to the posts of churchwarden which, according to Burch, had its origins in the rivalry between different religious factions. The vestry was at the centre of parish life, and was responsible for most of the day-to-day administration of local government. For most of the 17th century St Ann Blackfriars had an open vestry, which meant that its officers were elected annually from amongst all the parish's ratepayers and its meetings could be attended by all male householders. Close vestries were made up of freeholders who held office for life. The principal parish officer was the upper churchwarden, who was assisted by a deputy or under churchwarden. They were responsible mainly for the maintenance of church property and for organising the religious side of parish life. They were aided by a number of assistants or sidemen. The overseer of the poor (who was assisted by the under overseer), collected the poor rate, administered parish relief and was responsible for the removal of paupers to their parishes of settlement. Other units of administration were the precinct, which was made up of one or more parishes, and the ward, which consisted of a number of precincts. The wards (of which there were 26 in late 17th-century London) elected members annually to sit on the City�s Court of Common Council. St Ann Blackfriars was both parish and precinct. It was part of the ward of Farringdon Within, which was made up of 16 precincts. Precinct officers included constables (whose duties included executing warrants, making arrests and organising the parish watch), the surveyor of the highways (who made sure that householders fulfilled their obligations to pave and light the areas outside their properties), scavengers (who were responsible for ensuring that the streets were clear of refuse) and lamp collectors (who organised street lighting). Most of the precincts in Farringdon Within ward returned one member to each office, but in the 18th century St Ann Blackfriars (perhaps because of its larger population) always returned two. Traditionally, appointees had to serve or fine for the posts of scavenger and/or constable before being eligible for higher office in parish and precinct. Fining for lower offices did not exclude one from higher positions; it was common practice to fine for all offices except churchwarden or common councilman. Once established on the parish or precinct hierarchy advancement was by precedence and seniority (McCampbell, 1976, 120-21). None of these were paid positions, although it was generally accepted that officers would by various means make financial benefit from their positions. In 1662 a group of St Ann parishioners requested the creation of a select vestry with restricted membership, ostensibly to bring an end to the disorderly parish meetings which had become the norm during the Commonwealth period. The Vicar-General ordered the setting up of such a vestry, consisting of the curate, churchwardens and 39 "able and substantiall parishioners", who were listed by name. Entry to the vestry would now be by co-option rather than election. A protest group formed in opposition to the proposed select vestry, and as with earlier disputes this seems to have formed on factional lines, with the Puritan element standing in favour of the retention of the traditional open vestry system. The matter was referred ultimately to the ecclesiastical Court of Arches, but unfortunately the judgment of the court has not survived. However, the term open vestry was certainly used in the 18th century, which implies that the Puritans got their way. Some idea of the economic life of the parish at the end of the 17th century can be obtained from a study of the occupations of householders, as revealed by contemporary tax assessments. Much of the following is derived from a City-wide survey (Alexander 1989) which analysed two such assessments. These were the 1692 poll tax (known to contemporaries as the first quarterly poll tax) and the 1693 four shillings in the pound tax or aid. The latter is described by Alexander as "a levy of four shillings in the pound on the notional return or income from the individuals� business wealth and investments... in effect a tax on stocks. More precisely, it was a tax on net wealth since the assessment was to take into account debts owed by the tax payer". Since the assessments recorded the occupations of householders but not those of other members of their families or their lodgers, the picture they provide is far from complete. They tell us nothing of their employees and domestic servants or of the numerous tradesmen, journeymen and street vendors who were not householders but who made up the bulk of the population of the parish. A total of 308 householders were recorded in the parish of St Ann Blackfriars in the tax assessments of 1692 and 1693. Those engaged in manufacturing formed the largest group (comprising 168 householders) and within this group the textile workers were predominant. Of these, 74 gave their occupation as �tailor� and 12 as �shoe maker�. Associated trades occurred in fewer numbers; these included button making (3), fringe making (1) and glove making (3). One textile industry was almost exclusive to St Ann Blackfriars: seven of the eight fan makers listed for the whole of the City lived in the parish, where they worked in close association with a small number of hatters. Other types of manufacturing industries ranged from blacksmith (1) and wheelwright (1) to watchmaker (6) and jeweller (3). There were three tobacco pipe makers (discussed below) but only one potter. The second most common class of occupation was that involving the sale of commodities (principally food and drink), grouped under the general heading of dealing. 65 householders were included in this group and of these the victuallers formed the largest subgroup (36). No distinction was made in the tax assessments between licensed and unlicensed victuallers. The building trades employed 33 householders, mostly carpenters (9), sawyers (8), joiners (5) and bricklayers (5). There was presumably a far greater number of non-householders employed at these trades. Only nine people were recorded as working in the transport sector (carmen, porters, watermen etc), but again, these were occupations that would have been following mainly by those who did not have their own property. 27 householders provided professional services, with such diverse occupations as barber (5), minister (2) and poet (1). Finally, only six householders of the parish were classified as gentleman/woman. In that part of Puddle Dock Hill which lay within St Ann Blackfriars the following occupations were recorded in 1692: tobacco pipemaker, victualler (2), hatbandmaker, tailor (2), smith, feltmaker (2), shoemaker, barber, horner and chandler. Clearly, the parish was populated principally by those engaged in the textile industry, and in this respect was typical of the parishes in the south-western part of the City. The predominance of tailors might reflect the attitude of non-conformity which seems to have characterised the parish; certainly in the 18th century tailors were particularly active in pursuit of workers� rights and in the formation of trade combinations (Rule 1986, 256). Victuallers, and others engaged in the sale of foodstuffs, made up a significant proportion of the householding population. Other trades and industries were carried on, on a relatively small scale. Notably absent from the list of trades are those that were considered most noisome or offensive (such as tanning, glue making, soap making etc) and that were generally prevented by legislation from being carried out within the City walls. In relation to this it is perhaps surprising to find that there were tobacco pipe makers in the parish, since this was an industry which, in later years at least, was classed as one of the nuisance trades (Tatman 1994, 11). 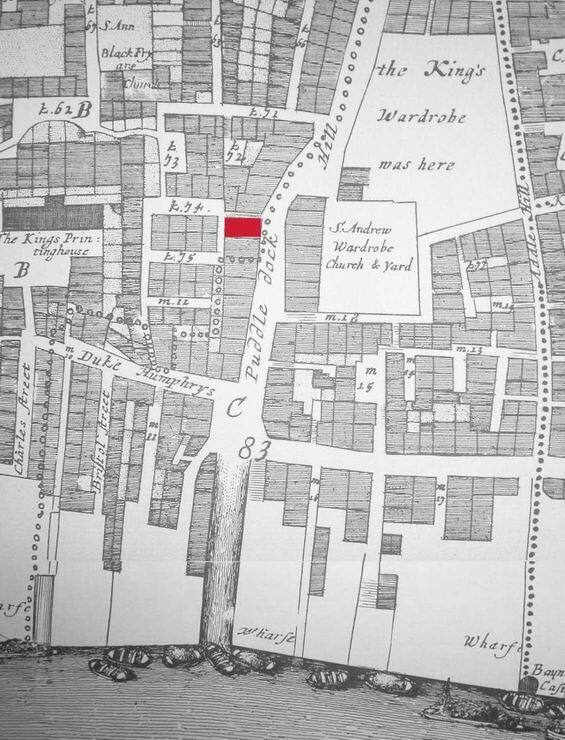 Of the 15 tobacco pipe makers recorded within the City walls in the 1692 and 1693 tax assessments, three lived in the parish of St Ann Blackfriars. There were of course a far larger numbers of pipe makers living and working in the poorer areas just outside the City (principally in Aldgate, Cripplegate and Spitalfields) and further afield in Stepney, Southwark and Westminster (Tatman 1994, 9). Those working within the City were among the poorer groups of artisans; Alexander suggests that their general level of wealth was similar to that of the metalworkers. They had a mean rent of �11 and a mean taxed stock of �17, and only five of the 13 pipe makers found in the four shillings aid were assessed for stock. The mean values of their rents and stock were less than those of the tailors, who are generally considered to have been close to the bottom of the manufacturing hierarchy. There were pipe makers in St Ann Blackfriars from at least 1678, and perhaps earlier. Little is known of them at present since detailed study lies outside the scope of the present paper. The extent to which they were continuing a tradition of pipe making established before the Great Fire is unknown. There is clearly great potential for further research into these late 17th-century pipe makers, who are listed below. William Fletcher occupied a house in Fryer Street from at least 1678. He was recorded at the same address in 1687, by which time he had married. After that date his whereabouts are unknown until his reappearance in Puddle Dock Hill (in the house which would later be occupied by the Tappin family) in 1690. This house had been vacant in the previous year, and before that had been occupied by William Moore (1687) and Mary Cure (1678-82), neither of whom are known to have been pipe makers. At the time of the 1692 poll tax Fletcher and his wife Mary were sharing the house in Puddle Dock Hill with Andrew Redhead, who was recorded variously as Fletcher�s servant and apprentice. Fletcher died in 1693, and his wife applied for and was granted the administration of his estate (GL ms 9168/27). She remained at the house in Puddle Dock Hill until at least November 1694, when she was named in a tax assessment. Two pipe makers of this name, presumably father and son, are listed by Oswald (Oswald 1975, 132). Both signed the Oath of Allegiance in 1696, one as an assistant of the company of tobacco pipe makers and the other as a journeyman. In June of that year one of them at least was recorded in a tax assessment as living in the house in Puddle Dock Hill occupied previously by the Fletchers. His whereabouts prior to this date are unknown; he does not appear in the 1692 or 1693 tax assessments for the City. In 1689 Francis Barker was living at the house in Fryer Street which had been occupied previously by William Fletcher. By 1692 he had acquired a wife and two children, and an apprentice, Humphrey Sinkes or Sinkler. The same household was recorded in 1694. His location after this date is unknown, although he was certainly not in Fryer Street by 1705. Thomas Selby and his wife occupied a house in Printers Street (later Printing House Street) in 1692-94. Previous occupants included Henry Maybor (1687-90) and Peter Leypoole (1681-82), neither of whom are known as pipe makers. Selby�s address after 1694 is unknown, although he was no longer in Printing House Street by 1705. However, Oswald does record a pipe maker called Thomas Selby in 1710 and his son Thomas who was freed in 1717 (Oswald 1975, 146). William Tappin (or Tapping) was born in 1661 or 1662. His father Richard was a "timberman", of Wel Newton (probably Welsh Newton) in Monmouthshire (Reg Jackson, pers comm). On 12 June 1677 William was apprenticed to the Bristol pipe makers Richard and Anne Nunney. Richard Nunney had been a founder member of the Bristol pipemakers� guild, and the Nunneys seem to have been one of the principal pipe-making families of that city (Jackson and Price 1974, 75). Having completed his apprenticeship William moved to London. The date of this is unknown, but since there are no known examples of Tappin pipes in the Bristol area it is likely to have been fairly soon after receiving his indentures. Since the term of apprenticeship was seven years it could not have been before 1684. William married Elizabeth, but no record of the marriage has been found and it is not known if it occurred in Bristol or London. It is possible that the couple were living in London by 1692/3, for on 26 February of that year Sarah, the daughter of William and Elizabeth Taping, was baptised in the parish of St Andrew Holborn [note that various spellings of the family name occur throughout the records]. The same parish register also records the baptisms of two other children of William and Elizabeth: Arthur Tapin (27 November 1695) and Elizabeth Tapping (10 March 1696/7). Unfortunately the register does not record the father�s occupation so it is impossible to prove that he was the pipe maker, although it does seem likely. The name Tappin (in any of its various spellings) does not appear in the 1692 poll tax assessment for St Andrew Holborn, so if this was the pipe maker he did not have his own premises at that time and was presumably working as a journeyman. By 1700 William and Elizabeth Tappin were living in the parish of St Ann Blackfriars. The parish register records the baptisms of two of their children: William, who was baptised on 21 July 1700 but died in November of the same year, and Abraham who was baptised on 9 April 1702. The name Tappin first appears in the records for Puddle Dock Hill on 3 June 1702, when William was listed in a tax assessment for the relief of orphans (GL ms 7771). He had taken over a premises which had been occupied previously by at least two other pipe makers: William Fletcher and Thomas Bailey (see above). The house was on the west side of Puddle Dock Hill, and was the second property within that part of the street which lay within the parish of St Ann Blackfriars. It can be identified easily on Ogilby and Morgan�s map of 1676 (Fig. 2). By comparing land tax rates it is possible to deduce that the property was slightly smaller than average for those on the west side of Puddle Dock Hill. Land tax assessments indicate that from 1707 to 1711, in addition to his contribution of �2 for his house, Tappin paid �3 8s for a neighbouring property to the north. This was separated from his house by a narrow passage leading into Church Alley (see Figure 2; labelled k74 on Ogilby and Morgan�s map). During the same period he applied annually for a victualler�s licence, as recorded in the returns of licensed victuallers for the City of London (CLRO ms ???). Presumably, rising fortunes had encouraged Tappin to try his hand as a publican. There are several other examples of pipe makers keeping public houses, probably because they were the principal outlets for their pipes. There are also many examples of pipe makers acting as suretors (as Tappin did on at least four occasions) in relation to other peoples� licence applications. It must have made good business sense for pipe makers to cultivate the good will of local publicans in this way. Since Tappin only kept his premises for four years, it is possible that this particular business venture was unsuccessful. An important fact has emerged in relation to Tappin�s application for a victualler�s licence. The applicants were required to state their trade, but Tappin was not described as a tobacco pipe maker. Instead he was recorded as yeoman, which was the title given to all those applicants for whom a specific trade was not stated. Possibly, these were people who did not belong to one of the City companies. Since he served his apprenticeship in Bristol, Tappin presumably did not enjoy the freedom of the City of London as a member of the tobacco pipe makers� company. Living in the liberty of Blackfriars he might have been able to avoid paying quarterage to the company. At the same time, when applying to the City for his victualler�s licence he might not have wanted to draw attention to his other business interests. Elizabeth Tappin died in 1713. The parish register records her burial on 3 December of that year. Less than two years later William (who was approaching his mid-50s) married again. His bride was Olive, the widow of William Chipps, a carpenter, who had died in 1711. She bore at least four children by her first husband, but it is not known if any of them were alive when she remarried. The marriage took place on 23 April 1715 at the church of St Bride�s, Fleet Street. Olive must have been considerably younger than Tappin because she bore him a son, William, Junior, who was baptised on 6 October 1717. Little is known about William�s later life. There is evidence that he was a figure of some standing in the local community. On at least two occasions he was called upon to fill precinct or parish offices. In 1708 he was chosen as a constable and in 1727 was elected overseer of the poor. On both occasions he declined the office and was fined for doing so, at a cost of �5 and �9 respectively (GL ms 9286). It is possible that his reason for refusing the office of constable was that he had recently set up as a publican and there could have been a conflict of interest. In a period when much court time was taken up by alcohol-related offences there was frequent debate about whether publicans should be allowed to serve as constables (George 1925, 47, 292, 389-90). Despite this, in 1735 about half of the retailers of spirits were constables (ibid.). William Tappin, Senior, died in 1742, at the age of 80. He had made his will on 3 January 1741. The document is brief, and unfortunately reveals nothing about his property or business interests. He bequeathed to his granddaughter Anne Griffith "all the household goods in the two pair of stairs [ie. second storey] room forward in my house on Puddle Dock Hill" and nominated his son William as his executor. Being illiterate, Tappin signed the document by means of a mark. He was buried on 8 May 1742 in the Tabernacle Ground, which was one of several places of burial in the parish. This seems to have been something of a privilege, for in that year only four other people were buried there; most people were interred in the Lower Ground (147 in 1742). Given that the former vestry room had sometimes been referred to as the Tabernacle, it is possible that the Tabernacle Ground was reserved for the burial of vestrymen and their families. Three days after his funeral his will was proved, and his son William was granted the administration of the estate (GL ms 9171/67). William, Junior, was his father�s youngest son, and his only child by his second wife, Olive. Nothing is known of William�s early life; apart from the record of his birth, the first reference to him to have been found is in his father�s will. He was married to Joanna, but no record of the marriage has been traced in either the parish records or in the International Genealogical Index for London and Middlesex. The couple do not seem to have had any children. Unlike his father, William, Junior, was not averse to holding public office and he became active in local politics. In 1749 he served as scavenger and in 1755 was elected as one of the two constables for the precinct. In the following year he attended a public vestry for the "regulation of the beadle". In 1763 he was elected upper overseer of the parish, presumably having served as under overseer in the previous year. During the next three years he was the under churchwarden, and also served as one of the auditors of the churchwarden's accounts (GL ms 1061). In the same period the upper churchwarden was a man called William Slade. Slade�s name appeared regularly in precinct and vestry minutes between 1745 and 1788. In 1745 he served as scavenger, in 1750 as constable and in 1758 and 1763-65 as lamp collector for the precinct. In 1766 and 1767 his title was "collector for lamps, sewers and pavements". He also held parish posts. In 1760 he was elected under overseer of the parish, in 1761 upper overseer, in 1762 under churchwarden and in 1763 he acted as one of nine churchwarden's assistants. From 1744/5 to 1788/9 Slade had a house in Blackfriars Street (known later as Broadway), in the north-western part of the parish. This was one of the principal streets of the parish; some of the former occupants of Slade�s house and many of his neighbours were prominent vestrymen and parish officers. Tappin and Slade seem to have been friends; their signatures appear together often in vestry minutes. Apart from serving together as churchwardens of St Ann Blackfriars, in 1765 they both acted as lamp collectors for the precinct. It is possible that the two men were connected by more than just their interest in local government: there was a pipe maker called William Slade who was apprenticed to Elizabeth Laurence in 1704, becoming free in 1712 (Oswald 1975, 140;146). In 1718 William Slade, pipe maker of Limehouse, underwent a Fleet Marriage to Elizabeth Bell of Aldgate (Tatman 1997, 28). In 1726 a William Sleete (Slade?) of St Botolph, Aldgate took John Simmonds as his apprentice. At present there is no evidence to indicate that William Slade of Blackfriars was the pipe maker of that name recorded in Limehouse and elsewhere. However, his close association with William Tappin in the 1750s and 1760s does make it a distinct possibility. During their tenure as churchwardens Tappin and Slade became embroiled in a controversy relating to a disputed election to the rectory. The inhabitants of the parish had in 1607 purchased the right of patronage from Sir George Moore. In the election of 1764 all male householders were entitled to vote, and the proceedings were overseen by Tappin and Slade as the principal parish officers. Following the election one of the candidates, the Reverend James Smith, issued a bill of complaint against Tappin and Slade (and others) for the conduct of the proceedings and in objection to many of the votes cast. Documents relating to the dispute (GL ms 3836) include a draft of the churchwardens' response. The election was re-contested on 22 January 1765 but the successful candidate, William Romaine, was not appointed until 26 February 1766. The long-running dispute probably explains why Tappin and Slade held their posts for three years; it was usual for the positions to be held for one year only. For the record, on the occasion of the first election Tappin and Slade both voted for one of the unsuccessful candidates, John Warner. In the second round they both gave their votes to Romaine. In 1767 Tappin and Slade stood down as churchwardens, but their exertions were recognised: vestry minutes record that "...the thanks of the said vestry was unanimously given to Mr William Slade and Mr William Tappin for their past services as churchwardens of the said parish during a course of three years, wherein they acquitted themselves to the entire satisfaction and approbation of such vestry and ordered a minute thereof to be made in this book to perpetuate to posterity the sense the said vestry retain for such services" (GL ms 4511/4). In the normal course of events Tappin might have been expected to complete his service to the parish with a term as upper churchwarden, but this was not the case. In fact, his name no longer appears in vestry minutes after 1767, suggesting that he dropped out of public life. While all this had been going on Tappin's pipe-making business seems to have thrived. In 1763 he took out a Sun Insurance policy on his "household goods, uttensils and stock" in his dwelling house on Puddle Dock Hill, to a value not exceeding one hundred pounds, for a premium of two shillings (GL ms 11936/144). He was one of only 32 pipe makers to take out an insurance during the period 1745-75 and was one of only three (one of whom was his widow, Joanna) working within the City walls between 1745 and 1772 (Oswald 1978, 362). Although the taking out of an insurance policy might indicate relative prosperity, Tappin was certainly not among the wealthiest pipe makers. His name does not appear in the records of the Hudson Bay Company, so he was probably not exporting his pipes (ibid.). Of the London makers who were producing pipes for the home market only, the majority took out policies for �200 or more, with some in excess of �500. Compared with these, Tappin's �100 policy was fairly modest. William Tappin, Junior, died in 1769, aged 51. He was buried on 30 March in the Tabernacle Ground, which was still a relatively exclusive resting place. He had made his will just over three months before his death. He named his "loving wife" Joanna as his sole beneficiary, bequeathing to her all his "estate and effects of what nature or kind soever both real and personal..." (FRC Prob 11/974 106). As with his father's will, no details of the estate were given. The will was proved on the day before his funeral. Joanna continued to make pipes at the same address and as "widow Tappin" was responsible for paying the land tax. In 1772 she took out a new insurance policy, for the sum of �200. For a premium of ten shillings she insured her household goods (�40), utensils and stock (�140) and wearing apparel (�20) (GL ms 11936/212). The increase in cover since her husband first took out a policy in 1763, might indicate that the family business had done well in the intervening years. Joanna died in 1775, at the age of 53. On 1 June she was buried in the Tabernacle Ground, with her husband. She does not seem to have left a will (indexes of all the ecclesiastical courts have been searched), and it is not known what became of her estate or the family business. Her house was acquired by Thomas Robinson, who was responsible for the land tax until at least 1778. He was also assessed for a larger property (possibly a public house) further up the hill. No evidence has been found to indicate that Robinson was a pipe maker, or that there was any family connection between him and the Tappins. In 1779 the house became part of the Parry estate. Mr Parry was presumably a speculator or developer. In that year he acquired a large block of properties which included those at the south end of Puddle Dock Hill (then known for the first time as St Andrew�s Hill) and in the courts to the west. After that date the names of individual tenants were not recorded, and it is impossible to tell who occupied the pipe makers� house. It is possible that Parry redeveloped the estate, although individual building plots remained unaltered until at least 1873 when the first edition Ordnance Survey map was drawn up. Subsequently the site of the pipe makers� house was redeveloped when the Times printing office was enlarged. No trace of the house remains today. Enquiries among members of the Society for Clay Pipe Research and the Society of Thames Mudlarks, and a search of Museum of London site archives and published sources has led to the identification of 213 examples of stamp-marked "WT" pipes and 29 pipes with the same initials moulded in relief on the sides of the heel. A small number of 19th-century pipes with the same moulded initials have been excluded from the study. Most of the pipes from the Thames foreshore, and all of the pipes from recent excavations by the DUA and MoLAS (1988-2000) have been examined by the writer. Colin Tatman has supplied illustrations of his large group of pipes from the foreshore. Most of the pipes from DUA excavations (1974-88) have been examined and recorded by David Higgins, who has provided copies of his illustrations. Some of the pipes from earlier excavations (by the former Guildhall Museum) have been published by Adrian Oswald. The pipe bowls have been classified according to two well-known typologies. Where possible the Simplified General Typology has been used (Oswald 1975, 37-41) since this gives more accurate dating for pipes of the 18th century. Otherwise, the Chronology of Bowl Types (Atkinson and Oswald, 1969) has been used. The prefixes OS and AO indicate which typology has been applied. Most of the stamp-marked "WT" pipes have been examined by the writer. Two stamp die have been identified, one of which looks like a crude copy of the original (Fig. 3). They are referred to in the catalogue below as stamp 1 (the original) and stamp 2 (the copy). Those pipes with stamps that cannot be identified positively because of damage, and some of the pipes that have been illustrated by other researchers, are described simply as "stamp-marked". Long, cylindrical or slightly flaring bowls with thick walls and large heels that are slightly oval in cross-section. A few examples have a slightly narrower heel. Internally, the bases of the bowls are broad and flattened. The stems are thick. At least three moulds have been identified. Medium-sized bowls with thinner walls; the heels are narrower and the stems more slender. Internally, the bases of the bowls are flattened. No complete bowls of this type have been found. Long bowls with the same thinner walls and stems as above, but with large, oval heels. They have a characteristic curve to the front of the bowl that gives them a slightly �full-bellied� appearance. Internally the bases of the bowls are flattened. All of the pipes of this type are from the same mould. They are well made, with smooth, glossy surfaces. Large bowls with thin walls, sometimes with an oval section. Internally, the bases of the bowls are smaller than earlier types; some are flattened, but others taper to a blunt point. The heels are small and oval in cross-section, and the stems are thin. Slightly shorter bowls with the same thin walls and stems. Internally, the bases of the bowls taper to a blunt point. The small, oval heels are slightly flared. All of the pipes of this type are from the same mould. Tall bowls with walls of medium thickness. The bowls are slightly fluted, and have large, cylindrical heels (unlike the pipe illustrated by Atkinson and Oswald which has a spur). Internally, the bases of the bowls are flattened, and slope down towards the stem junction. The stems are of medium thickness. This is an unusual bowl form for London, and is more like a West Country style. All of the pipes of this type are from the same mould. General classification for all of the tall, upright bowls, with rims that are parallel to the line of the stem, that were common during most of the 18th century. Some of the pipes in Colin Tatman�s illustrated catalogue have been recorded as AO25 (late type); these are likely to be type OS12, and have been reclassified as such in the catalogue below. 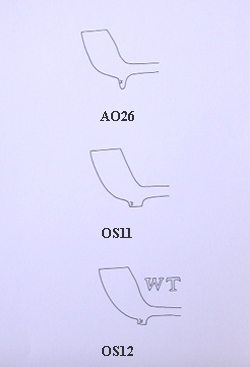 Some of the type AO25 pipes illustrated by Tatman have been reclassified here as types OS10 and OS11 (variant). This bowl type is not included on Figure 4. Bowl types OS11 (1730-60) and AO26 (1740-1800) occur once only with moulded initials on the sides of the heel. 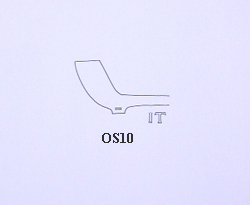 There are two possible examples of bowl type OS10 with moulded marks. Most of the mould-marked pipes examined by the writer are of type OS12 (1730-80). A greater number have been classified by David Higgins as "type AO25 variants of c. 1760-1800, characterised by thin stems, thin-walled bowls and, in particular, the style of the letter W which is rather large and has a distinctive style of serif" (unpublished manuscript). These have been reclassified in the catalogue below as type OS12 pipes. 4 type OS12 marked with stamp 2. One is complete, with a stem length of c. 360mm. It has an internal cross. Table 1 shows that of the material studied, there are considerably more stamp-marked pipes than mould-marked pipes. This should not be taken to mean that more of the stamp-marked pipes were produced. It is simply because most of the pipes considered in this survey are from private collections, and collectors were not asked to supply information on mould-marked pipes. If the pipes from recent (DUA and MoLAS) excavations in the City are considered separately, it is seen that 27 are stamp-marked and 28 are mould-marked. This is likely to be a more realistic ratio. 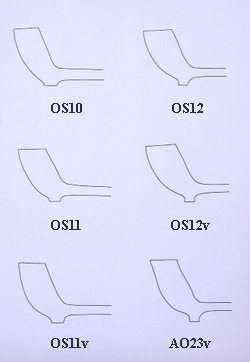 Stamp 1 occurs on bowl forms OS10, OS11, OS11 (variant), OS12, AO23 (variant) and AO25. This suggests that it was in use from c. 1700 until at least c. 1730, and possibly longer. Even when changes in style resulted in pipe bowls with a smaller heel, the same stamp was applied; ultimately the stamp die was too large for the pipe heel and only part of the mark was imprinted. Stamp 2 (which looks like a crude copy of stamp 1) occurs only on the latest bowl forms OS12 and OS12 (variant), that are dated typologically post 1730. Even stamp 2 was sometimes too large for the heel to which it was applied. Oswald describes mould-marked pipes from Wood Street and Farringdon Road that are supposedly similar to his illustrated examples of stamp-marked type OS10 pipes. For the purpose of this study they have been recorded as type OS10, although it has not been possible to confirm this by examination, and they are not shown on Figure 5. There is one each of types OS11 and AO26. Most of the mould-marked pipes are of type OS12. Seven of these have been examined by the writer (from VAL88 and KEW98) and they are definitely from the same mould. They are almost certainly from the same mould as the 17 examples described by David Higgins as "type 25 variants", that have been reclassified here as type OS12. Colin Tatman has supplied an illustration of a pipe from Paul�s Wharf that is also likely to be from that mould. There is only one instance of bowl types OS10 and OS12 being found in the same archaeological deposit (PIC87). There is also a single example of types OS11 and OS12 being found together (KEW98). Mould-marked and stamp-marked pipes of type OS12 occur together frequently, suggesting that they were in production at the same time. It is significant perhaps that among the large group of OS10 pipes from Crabtree Wharf there are no mould-marked pipes. Eight of the "WT" pipes have internal bowl marks. The purpose of these marks (which occur occasionally in the base of the bowl cavity of 18th-century pipes) is not understood fully. The mark was incised in the end of the stopper used to form the bowl cavity, and appears therefore in relief inside the pipe. Generally, simple crosses are most common, and this is true of the "WT" pipes. Crosses are found on four type OS12 pipes marked with stamp 2, one mould-marked OS12 and two stamp-marked AO25. The other internal mark is a grid pattern (like a "noughts and crosses" board) that is found on a type OS11 pipe marked with stamp 1. There are relatively few "WT" pipes from closely-dated deposits. Oswald describes both mould-marked and stamp-marked pipes from 4-9 Wood Street, in pits dated 1720-50. This was the site of Tom�s Coffee House, which closed in 1740. At 22-25 Farringdon Street similar pipes were found in the backfill of a cellar, in a deposit dated c. 1720-30. There is a stamp-marked type OS10 from a deposit that contained pottery of post 1760 (VAL88) and another from a cellar backfill that also produced a mould-marked type OS12, pottery of post 1720 and a halfpenny of George II dated 1740 (PIC87). The large group of type OS10 pipes from Crabtree Wharf were found in association with domestic pottery of the late 17th- and early 18th centuries (Peter Elkins, pers comm). One stamp-marked type AO23 (variant) and a mould-marked pipe of type OS11 were found in association with a large group of pottery dated post 1740 (VAL88). The largest single group of "WT" pipes from the City of London consists of nine type OS12 pipes (both stamp-marked and mould-marked) that were found in a pit with pottery dated 1730-70 (AHA87). Three mould-marked type OS12 pipes were found in a cesspit with pottery of post 1770 (PIC87). Other type OS12 pipes (stamp-marked and mould-marked), and a type AO26 came from a pit containing pottery of post 1770 (VAL88).Three type OS12 (variant) marked with stamp 2, and a mould-marked pipe of type OS12 were found in a pit that contained pottery dated post 1720. 174 "WT" pipes (72% of the total studied) have been found in the City of London. 63 (26%) were found at Crabtree Wharf, Fulham and the remaining five (2%) are from scattered locations to the west of the City. Figure 6 shows clearly that the majority of the "WT" pipes from the City have been found within a 650m radius of the Tappins� house in Puddle Dock Hill. 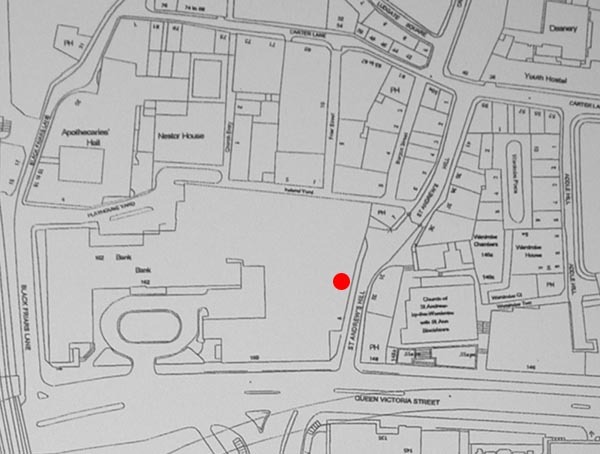 Only four pipes (2.3% of those from the City) have been found outside of this area, in Lovat Lane and on the Custom House foreshore, both in the south-eastern corner of the City (find-spots not shown on Figure 6). To some extend this distribution reflects the fact that many of the pipes are from the Thames foreshore, and the stretch of river between Blackfriars Bridge and Southwark Bridge is the part that has been searched most intensively in recent years. Analysis of the distribution of pipes from archaeological excavations is more indicative. It reveals that 18 of the 26 stamp-marked pipes and 24 of the 28 mould-marked pipes (in total, nearly 78% of the pipes from City excavations) have been found within a 400m radius of Puddle Dock Hill, mostly within the parish of St Ann, Blackfriars or in the grounds of the nearby Fleet Prison. It is now beyond reasonable doubt that 18th-century pipes marked with the initials WT were made by the Tappin family. Figure 6. Map showing concentrations of "WT" pipes within the City of London. 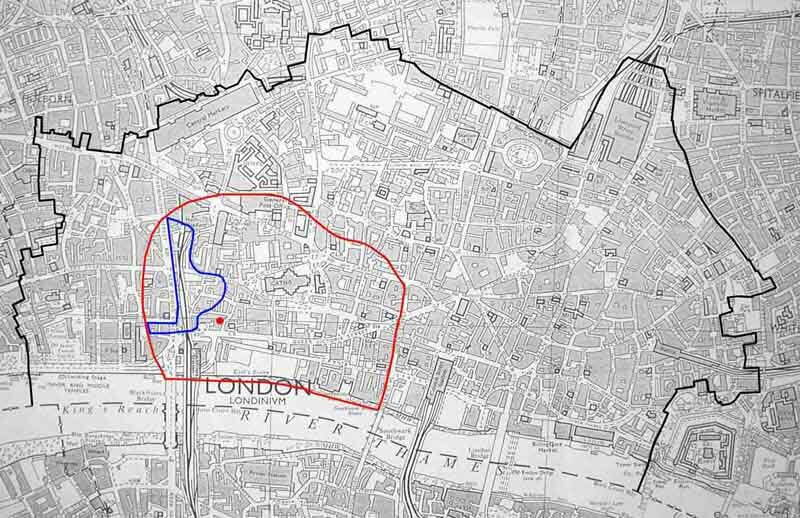 Black line: City of London boundary; Red line: area that has produced 97.7% of all the "WT" pipes found in the City; Blue line: area that has produced 77.8% of the "WT" pipes from City excavations; Red dot: approximate location of the Tappin family's house and workshop. The presence of a large group of type OS10 pipes at Crabtree Wharf, Fulham (about six miles from Puddle Dock Hill) requires some explanation. The pipes (dated typologically 1700-40) were found in a rubbish dump that pre-dated the construction of the wharf, between the beer garden of the Crabtree public house and the River Thames. The absence of bowl types OS11 and OS12 (both of which appeared after c. 1730) suggests that this deposit accumulated within the period c. 1700-30. In the 18th century Crabtree was a rural hamlet surrounded by fields and market gardens. The site of the Crabtree public house was occupied then by an inn called the Potthouse; although the earliest reference to this seems to be from 1763, when it was in the tenure of a Mr Jackson (Feret 1900, vol III, 84), the discovery of a rubbish dump containing a large quantity of pipes (in association with pottery and other domestic refuse) implies that there was an inn on the site in the early 18th century. One of the Tappins (probably William, Senior, given the likely date of the pipes found there) must have had a contract to supply pipes to the inn. It would have been easy to transport the pipes by river from Puddle Dock to Fulham. Although this style of marking was almost unknown in the London area after c. 1650 it remained relatively common in Bristol. In the second half of the 17th century Bristol makers often stamped their initials on the base of the heel or on the back of the bowl. In the 18th century combinations of stamped marks and moulded initials were sometimes used, and there was the introduction of the moulded or stamped cartouche on the side of the bowl. 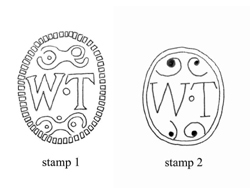 A number of published examples of makers� heel stamps from Bristol are very similar in execution to Tappin�s mark (Jackson and Price 1974, 88-120). For example, numbers 42-51 (p. 92) are a group of mid-late 17th-century pipes marked with the initials WC. There are scrolls above and below the initials and in one example (number 52) the mark has a discontinuous oval frame of dots which is similar to the indented frame found on the Tappin mark. Similar marks were used by makers with the initials EL (numbers 160-162, p.101), AN (numbers 185-186, p.103), FR (numbers 226-228, p. 107; these having the dot between the initials which is also found on the Tappin mark), TS (number 242, p.108) and IT (numbers 252-255, p. 109; these without the scrollwork but with the oval frame of dots). All of the examples above appear to date to the second half of the 17th century. None of the 18th-century pipes illustrated by Jackson and Price have stamped heels, and the bowl stamps and cartouches of this period are generally less ornate, without the scrollwork found on the earlier heel stamps. It seems that this type of mark was very much a Bristol style of the mid-late 17th century. A review of published sources has failed to identify similar marks from elsewhere in the country. Since it is known that William Tappin, Senior, served his apprenticeship in Bristol between 1677 and 1684, it seems likely that he obtained his stamp die there and took it with him when he moved to London. This style of stamped mark was probably already going out of fashion when he acquired the die. Having set himself up in business in London he used his Bristol die (stamp 1) to mark his pipes, and eventually he passed it on to his son. William, Junior, continued to use it despite changes in bowl styles that led to smaller heels that effectively made this method of marking redundant. He even had a crude copy made (stamp 2), when the original became worn out. Whether or not the same die was used by Joanna Tappin after her husband's death in 1769 cannot be known for certain, although both stamp-marked and mould-marked pipes have been found in association with pottery dated post 1770. A review of Museum of London archives shows that since 1974 13 bowls of type OS10 have been found with the initials IT (possibly JT) moulded on the sides of the heel. 12 of them were found in the Fleet Valley (VAL88), and of these 10 were from the same deposit. All 12 were made in the same mould. They are tall and slender, with relatively thin walls for bowls of this type. They have reasonably well-pronounced heels and thick stems. Internally, the base of the bowl is broad and flat. Another pipe with this mark was found in Spitalfields (SRP98), outside the north-eastern boundary of the City. It is slightly wider and clearly from a different mould. Oswald refers to examples of 18th-century mould-marked "IT" pipes from the Thames foreshore (Le Cheminant collection) and Fulham (Atkinson collection). He illustrates the latter, and it appears similar to the examples from the Fleet valley, although he describes it as having "the thinner stem introduced c. 1760" (Oswald 1978, 360, 373). Since most of the known examples of 18th-century pipes marked "IT" have been found in the vicinity of Puddle Dock Hill it is likely that they were made by Joanna Tappin. However, if they were made after her husband's death, then Joanna must have been using a somewhat "old-fashioned" mould. Documentary research has shown that two generations of the Tappin family made clay tobacco pipes in Puddle Dock Hill over a period of 75 years. William, Senior, learnt the trade in Bristol before moving to London as a journeyman. He probably settled first in Holborn but soon relocated to Blackfriars, where he acquired a house and workshop that had been occupied previously by at least two other pipe makers. In Blackfriars there was a tradition of freedom from interference from the City companies that might well have attracted outsiders like Tappin. As a master pipe maker he used a distinctive stamp die, that he had acquired in Bristol, to distinguish his products. The stamp-marked pipes of types OS10 and AO23 (variant) can be attributed to William, Senior. The latter, being an unusual bowl type in London, might even have been made in a mould that he brought with him from Bristol. His son William, Junior, was born in Blackfriars. He became a prominent local citizen and played an active role in the government of his parish. When he inherited the family business he continued his father�s practice of marking his pipes with a stamp, and even had a copy of his father�s die made when the original became worn out. He also adopted the conventional method of mould-marking. The type OS11 and OS12 pipes (and their variant forms), both stamp- and mould marked, are more likely to have been made by William, Junior. Joanna Tappin might have used her husband�s stamp die after his death, but she also made pipes with her own initials moulded on them. It was not unusual for pipe makers� widows to inherit their husbands� businesses, and under Joanna the workshop continued to thrive. This is thought to be the first time that the distribution of the products of a single family of London pipe makers has been examined in detail. Within the City, pipes made by the Tappins had a limited range, mostly in and around the Blackfriars area. It is interesting and perhaps significant that no Tappin pipes have been found across the river in Southwark, where excavations have produced as many if not more pipes than the City. The extent to which the pipe makers� company was able to control the distribution and sale of pipes is unknown, but it is possible that the Tappins (who were not members of the company) had difficulty selling their pipes outside of the liberty of Blackfriars. William, Senior, was however able to supply pipes to the Potthouse Inn at Crabtree, and at least one of his pipes has been found as far away as Brentford. It is hoped that as a result of this paper further examples of Tappin pipes will come to light. Numbers in square brackets are context (deposit) numbers. Those in angular brackets are accession (registered find) numbers. Above all I would like to thank Tony Pilson, of the Society of Thames Mudlarks, who first brought the "WT" mark to my attention and provided the inspiration for this project. I am indebted to the following people for allowing me to examine their pipe collections or for supplying illustrations of pipes in their possession: Peter Elkins, David Higgins, Phil Nicholls, Colin Tatman and Susie White. Richard Le Cheminant provided information on the pipes from Paul�s Wharf. The late Adrian Oswald commented on the pipe maker William Slade, and Reg Jackson advised on Bristol pipes and pipe makers. A number of former colleagues at MoLAS assisted with the preparation of this report, notably Barney Sloane who commented on an early draft of the text. The illustrations are by the writer.